Dicyclopentadiene (DCPD) Market size was estimated over USD 550 million in 2016 and the industry will grow by a CAGR more than 4.5% up to 2024. Dicyclopentadiene (DCPD) is a cyclopentadiene dimer and produce in huge quantities through the steam cracking of petroleum products like crude oil, naphtha, gas oils to ethylene. It is a white crystalline chemical compound with acrid odor and widely used for the production of specialty resins. 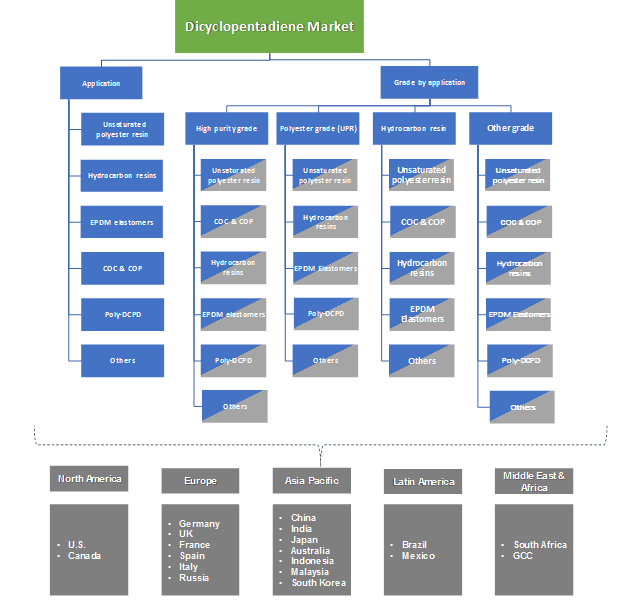 Increasing demand from the Asian countries will be a key driving factor that will positively influence the dicyclopentadiene market in coming years. More than 60% of the product are used to produce unsaturated polyester resin, hydro-carbon resins, poly dicyclopentadiene and these are further used in the manufacturing of big containers, pipes, heavy & light vehicle body, sanitary ware, construction equipment’s, etc. As the automobile sector is in high demand in Asia Pacific region and the presence of producers with large production capacity will significantly spur the unsaturated polyester resins (UPR) industry, hence will boost the DCPD market by 2024. Simple processing, fine mechanical property, chemical-erosion resistance and electricity performance are the key characteristics of UPR which makes it suitable for agriculture, transportation, and other industrial applications. Significant growth in end-use industries in developing economies will have a positive impact on the DCPD market growth in future. As the product is used in the form of key ingredient to produce paints & coatings, adhesive, rubber, pesticides & insecticides, varnishes, modified wax and other non- woven products due to its superior mechanical and functional characteristics. Inflated price of high purity grade dicyclopentadiene and availability of substitute products are the key restraining factors for the industry growth in forecast spell. Phthalic anhydride is used as dicyclopentadiene substitute in various applications include vehicle & boat shell building. This in turn, will be hampering the market growth in forecast period. DCPD market is bifurcated into high purity, polyester resin and hydrocarbon resin grades. The other grades of dicyclopentadiene include polymer, low purity, etc. Polyester resin (PR) grade was valued at over USD 300 million to seize around 50% of the overall market share in 2016 and is likely to expand its market share in forecast years. This is all due to its wide usage for the production of unsaturated polyester resins as the product contains low co-dimers and trimers and has favorable color features compared to other grades, this provides excellent mechanical and functional properties such as resistance to heat and corrosion, low weight, etc. Hydrocarbon resin grade held over 20% of the entire market share in past year and will lose its share in future due to its low purity. This in turn, will strengthen the high purity, polyester grade dicyclopentadiene market penetration in coming years. 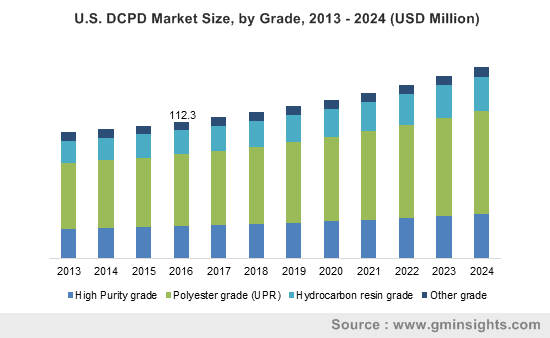 Unsaturated polyester resin and hydrocarbon resin are the dominant application segment in DCPD market collectively accounting for over 70% of the overall market share and is likely to grow at a substantial rate in coming years. The product is as a raw material in the production of specialty resins and elastomers due to its extra-ordinary physical properties such as thermal stability, rigidity, mechanical strength, etc. EPDM elastomer accounted for over USD 60 million for DCPD market in 2016. The product is extensively used as diene to manufacture EPDM rubbers or elastomers in order to improve the strength of rubber and also prolong the using life of rubber. Positive growth in rubber & tire industry will positively stimulate the dicyclopentadiene market demand in the near future. Asia Pacific was the key contributor to the DCPD market and accounted for more than 45% of the entire industry in 2016. The regional market share will likely expand in future due to the significant rise in automotive sale and growth in other manufacturing activities. Increasing demand from storage industry for the production of cryogenic tanks which are widely used to store the natural gases, frozen biological materials coupled with rapidly growing paint & printing inks industry will contribute towards the DCPD market development in the near future. In 2016, North America had a market share of over 25% of DCPD market and is expected to register an annual growth rate of around 4% over in future, driven by the presence of various chemical companies in the U.S. and significant consumption of unsaturated polyester resins by end-use industries. Braskem, Dow Chemical Company, Cymetech Corporation, LyondellBasell Industries Holdings B.V, Shell Chemicals, TCI Chemicals, NOVA Chemicals, Chevron Phillips Chemical Company, Maruzen Petrochemical, Texmark Chemicals, Inc., China Petrochemical Corporation, Zibo Luhua Hongjin New Material Co., Ltd., Nanjing Yuangang Fine Chemical Co and Sunny Industrial System GmbH are the key industry players in dicyclopentadiene market. The manufacturers participated in the merger, acquisition and other events for the expansion of their production capabilities and geographical reach around the globe. For an instance, in January 2016, Braskem sold its subsidiary “quantiQ” and this divestment will further strengthen the petrochemical operation and financial profile of the company. In September 2017, The Dow Chemical Company had a merger with E.I. du Pont de Nemours & Company (DuPont) and formed DowDuPont. This will positively stimulate the company’s growth and position in the industry. Significant growth in various industries such as electronics, automotive, construction and others will bolster the DCPD market growth in forecast spell. This is due to the extensive usage of the product as a key raw material for the production of different varieties of resins which are further used to manufacture the automotive components & parts, cryogenic tanks, electronic parts, etc. Moreover, the significant production expansion in North America and Asia Pacific regions will propel the market growth in the forecast timeframe.